The exclusion of Southern representatives from Congress from December 1865 to the summer of 1868 raises two problems for the Fourteenth Amendment’s legitimacy: Congress (a) proposed the Amendment while excluding Southern representatives in 1866, and (b) required Southern states to ratify as a condition for readmission in 1867. Scholars like Bruce Ackerman, John Harrison, Akhil Amar, and most recently Thomas Colby have proposed a wide variety of conflicting ways to handle these problems. Ackerman explains the Amendment’s legitimacy on the basis of President Johnson’s 1868 capitulation to a non-Article-V process, confirmed by the Supreme Court in 1873. Harrison relies instead on the unreviewable finality of congressional membership decisions and pressured state ratifications, Amar on congressional power to republicanize Southern states with black suffrage, and Colby on the normative desirability of an intergenerationally-authored Fourteenth Amendment including cases like Brown and Roe. A less-strained and historically-much-better-supported approach grounds Fourteenth Amendment legitimacy on the South’s forfeiture of Article I and Article V rights upon secession. The South had no right to participate in federal lawmaking process, either as legislators or as part of the Article V denominator, until the Union’s military victory was sufficiently secure in the view of Congress. 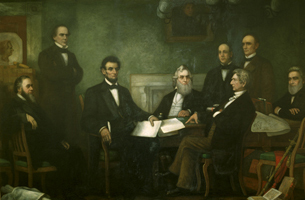 Given a loyal Article V denominator, the Fourteenth Amendment became law on February 12, 1867, with Pennsylvania’s 20th ratification out of 26 congressionally-represented states, as opposed to July 1868, when 28 of the full 37 states had ratified, including 8 ratifications squeezed out of the South. More interpretively important than the change in the time of adoption is the change in the constitutional author: we should understand the meaning expressed by the text as uttered only by the loyal North, not as if it were uttered in partnership with former Confederates. Ackerman, Harrison, Colby, and especially Amar have all noted the possibility of a loyal-denominator solution to Fourteenth Amendment legitimacy and the existence of substantial support for the theory. This article, however, canvasses its historical support during Reconstruction, and gathers their argumentation, far more thoroughly than has been done before. A great many Republicans espoused the theory, beginning from the very beginning of the war and continuing through 1868 and beyond, and their theories were not limited to either Charles Sumner’s state-suicide theory, Thaddeus Stevens’s theory of successful secession and reconquest, or the view that Southern states were not republican in form. The key for most advocates of the view was instead reliable loyalty in the face of secession. While some important Republicans, like President Lincoln in speaking of the Thirteenth Amendment, were agnostic on the issue, virtually no Republicans gave full-throated criticisms of the loyal denominator. A loyal denominator was also adopted by many early scholars to consider the issue. This Article explains the loyal-denominator view and focuses on its prevalence during and after the Civil War and Reconstruction. 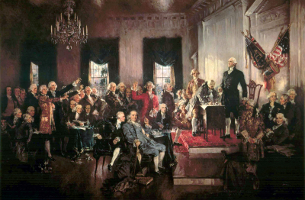 A sequel will defend loyal denominatorism under the meaning expressed by the relevant constitutional language at the original Founding and investigate the implications of a Northern-authored Fourteenth Amendment both for its interpretation and for democratic theory. I've hinted at this view a few times on the blog, and it was mentioned a few times during the discussion of Tom Colby's paper at the originalism conference last February--see here, here, and here for the videos. I'll have some posts here explaining a few key chunks of the view in the next few weeks. Please send me any comments!